Friday night: Mostly clear. Lows in the 20s. Saturday: Sunshine to increasing clouds. Highs around 40. 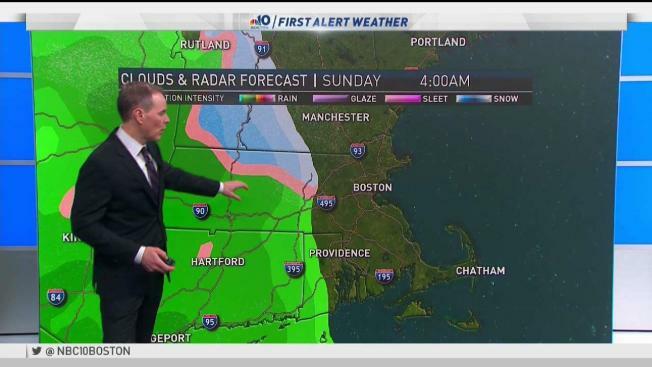 Sunday: Predawn mix to rain showers, wintry mix continues Northern New England. Highs in the 40s, 30s north. Our quiet weather continues for Saturday. Overnight lows dip in the 20s and teens, with icy spots developing and a clear sky. Increasing clouds Saturday afternoon and seasonable highs in the low 40s. On Sunday, a low pressure system tracks well northwest of us and deepens significantly. We will be in the warmer section of this storm in Boston, but there is a short chance for a wet snow or mix to fall across northern Connecticut, Rhode Island, and Massachusetts on Sunday morning, changing to rain late morning. The heaviest rain will be for the first half of the day, with scattered rain showers lingering in the afternoon and some ice lingering across the Worcester Hills and Berkshires before switching to rain around noon. Vermont, New Hampshire and Maine will see snow starting Sunday morning, then a mix and lingering snow through Monday. A First Alert is up for northern New England on Sunday for the snow and ice covered roads that will make travel difficult. With the deep low pressure center north of us Monday morning, our wind will crank up in intensity. We're expecting widespread gusts between 45 and 55 mph and isolated spots with 60 mph winds. This may lead to power outages and damage across the northeast, even though we will be partly cloudy and in the 30s. We have a First Alert for the wind threat on Monday. Arctic air is ushered in after the windy Monday. Highs Tuesday through Wednesday will be in the upper 20s, with overnight lows in the teens. On Wednesday, there is a chance for a quick moving clipper that could bring light snowfall across the northeast. The forecast models are not in agreement through the rest of the 10-day forecast, so we will be sure to update you to any changes. Thursday into Friday will be in the 30s. From Friday night into Saturday, another storm may pass by New England as a wintry mix, followed by Sunday sunshine and around 30 degree temperatures.